Melisandre calls Jon 'The Prince That Was Promised'. Previously she had called Stannis this. It is suspicious that she is calling Jon the same name... if it is Jon, that is! Stannis's best friends were Mel and Davos. The newly resurrected Jon Snow's best friends are... Mel and Davos! Davos even lays his life on the line for Jon, and is desperate to have him brought back to life (or use his body as a vessel for Stannis, his true king). He is willing to die to protect Jon from the Nights Watch. Would Davos really risk so much for a perfect stranger? No. It makes no sense... unless he knows it is Stannis inside Jon. The resurrected Jon also does not care about the people who were his friends. He is very dismissive towards the Nights Watch, being mean to Ed and even killing his squire for being a traitor, a very Stannis-like action! 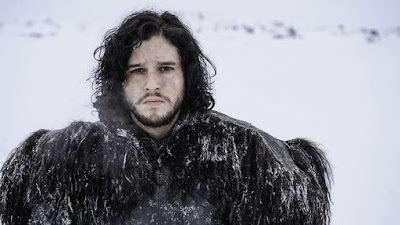 The first thing the resurrected 'Jon Snow' does is to kill the traitorous members of the Nights Watch. This is very important, as it shows that it must be Stannis inside him. We had previously seen that Jon killed traitors with the personal touch, by cutting off their heads. This new 'Jon' instead used the impersonal method of a specially constructed gallows. He then had their bodies burnt with fire, another of Stannis's hobbies. Jon Snow is definitely dead as we saw him stabbed to bits by the Nights Watch. However we never saw Stannis die. It is entirely possible that during his confrontation with Brienne, Stannis warged his soul into Mel's necklace to escape. Mel then placed his soul into Jon's body. What of Jon's soul? Where did it go? Possibly to hell, as Jon betrayed the Nights Watch, however a more obvious answer is that he warged his soul into Ghost, his wolf. The name of Ghost indicates that he does indeed have a ghost living inside him. Now we have the situation where Stannis-Jon is palling around with Jon-Ghost. But will Jon want to get back inside his body? When Jon Snow dies he has delightful curly hair. When he comes back to life, he has short hair like Stannis. Hair is the window to the soul, and shows a different soul may be present. While at the Wall, Stannis wants to take an army of Wildlings and march on Winterfell. Jon Snow does not. Post resurrection, the first thing that 'Jon Snow' does is to take a Wildling army to march on Winterfell. This is very suspicious! The most damning evidence is this: Everyone thinks that the show has deviated from the books, but what if it has not? Book 5 ends with Ramsey sending the Pink Letter and Stannis's forces camped outside Winterfell. Jon Snow is dead at this point. If the resurrected Jon is actually Stannis, then the show once more matches the book - Jon Snow is dead, whilst Stannis marches on Winterfell! This genius twist will both shock audiences, make the show more true to the source material, and enable GRRM to catch up with the action for book 6, allowing book and show to once more unite perfectly! Jon Snow became the commander of Night's Watch and his first step was to become ally with wildlings. He knew what would it take to do that but still he cared about wildlings. He went to their place, convinced them and fought with them against white walkers and army of the dead.